…no one knows this more than bestselling author Debbie Macomber. She began knitting at age 10, and as she has said many times, learning to knit saved her life. As a child she struggled with dyslexia and knitting helped her learn to read, do math and so much more. I have found that mission to be true in all of the yarn shops I’ve visited in Northwest lower Michigan. There always seems to be a place to sit – a well-worn rocking chair, a round table and chairs or comfy couch – the place to get help reading a pattern or finding a dropped stitch or just catch up on the latest news. The staff at Debbie Macomber’s shop sponsors some 16 to 20 social gathering opportunities each and every month. On Tuesday afternoons knitters gather to work on a variety of philanthropic projects like caps for premature babies, chemo caps, sweaters for children and breast prostheses called Knitted Knockers. Knitted Knockers are special, handmade breast prosthesis for women who have undergone mastectomies or other procedures to the breast. They are soft, comfortable knit prosthetics for breast cancer survivors. Traditional breast prosthetics are usually expensive, heavy, sweaty and uncomfortable. The women at A Good Yarn learned about them after one staffer had a breast cancer scare and another was diagnosed with it, recalled Macomber during a recent phone conversation. “We were getting calls from all over the country with women wanting them because they are so much more comfortable,” said Macomber. Although many women prefer flesh-colored Knockers, you can get creative and fashion them in fun colors as well, from hot pink to bright blue, and in a variety of cup sizes. There is a huge demand for Knockers and they are distributed for free to any woman who would like them. In anticipation of Macomber’s upcoming May 7, 2015 NWS visit to Traverse City, we’d love knitters to bring their finished Knockers to the May 7 event or to a participating local yarn shop by May 14 so we can get them in the hands of women who need them and put a smile on the face of someone who is in a low point in life. 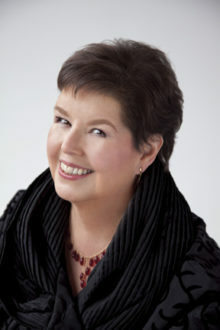 Debbie Macomber will be a guest artist on the NWS stage on Thursday, May 7 at 7 pm, with guest host Ron Hogan, acquiring editor for the Regan Arts publishing house and founder of Beatrice.com.